Surface-mounted luminaire with the same characteristics as mod F 1126. 32 + 40 W circular fluorescent lamp. dimensions: side mm. 445. h. mm. 230. Surface-mounted luminaire for directional fluorescent lamps, molded in a well. Made of anti-shock plastic material in white or red. Internal frame in sheet steel, painted in white, carrying all the electrical accessories. Cover-cathodes in black. 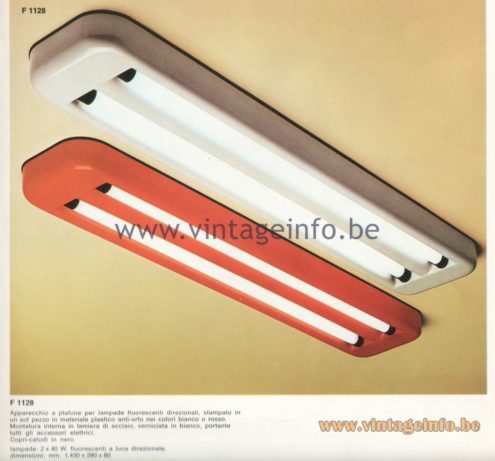 2 x 40 W. fluorescent lamps with directional light. dimmensions: mm. 1,430 x 280 x 80. 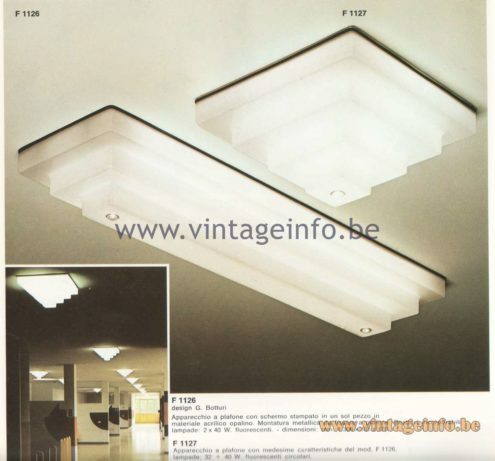 Surface-mounted luminaire with diffuser screens – opal plastic interior; exterior light smoke. Frame In chromed metal. Embeddable reactors. 1 x 40 W + 1 x 32 W circular fluorescent lamps. Dimensions: ∅ mm, 730, h. mm, 360. Surface-mounted luminaire with the same carratteristische dem mod F1130. lamps: 1 x 22 W. + 1 x 32 W. circular fluorescent lamps. Dimensions: ∅ mm, 470, h. mm, 240. 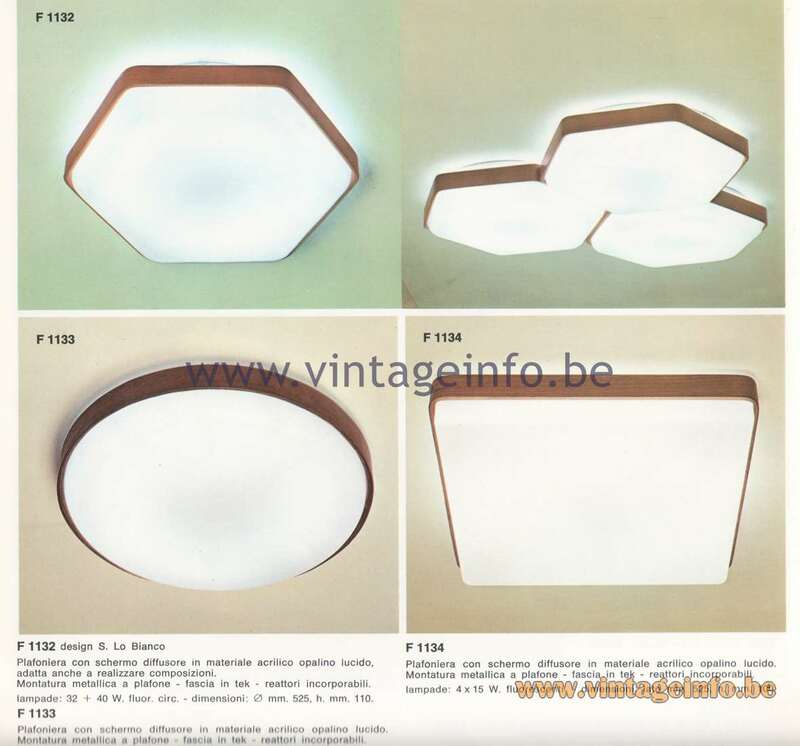 Ceiling lamp with diffuser screen in glossy opal acrylic, also suitable for compositions. Ceiling-mounted metal frame – teak band – embeddable reactors. lamps: 32 4- 40 W. fluor. circ. 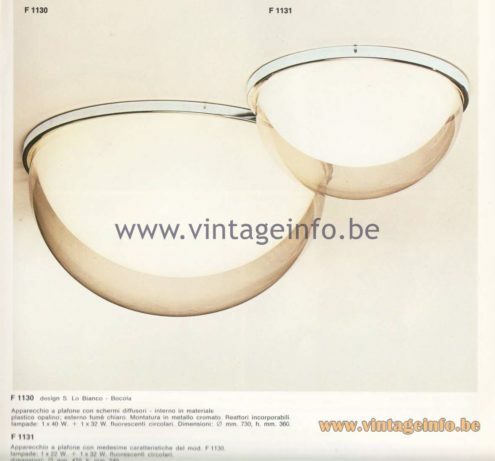 – dimensions: 0 mm. 525, h. mm. 110. Ceiling lamp with diffuser screen in glossy opal acrylic material. Ceiling mounted metal frame. teak band – embeddable reactors. Ceiling lamp with diffuser screen in glossy opal acrylic material. Ceiling-mounted metal frame – teak band – embeddable reactors. Ceiling lamp for single application or for compositions – molded in opal acrylic – Embedding reactors. 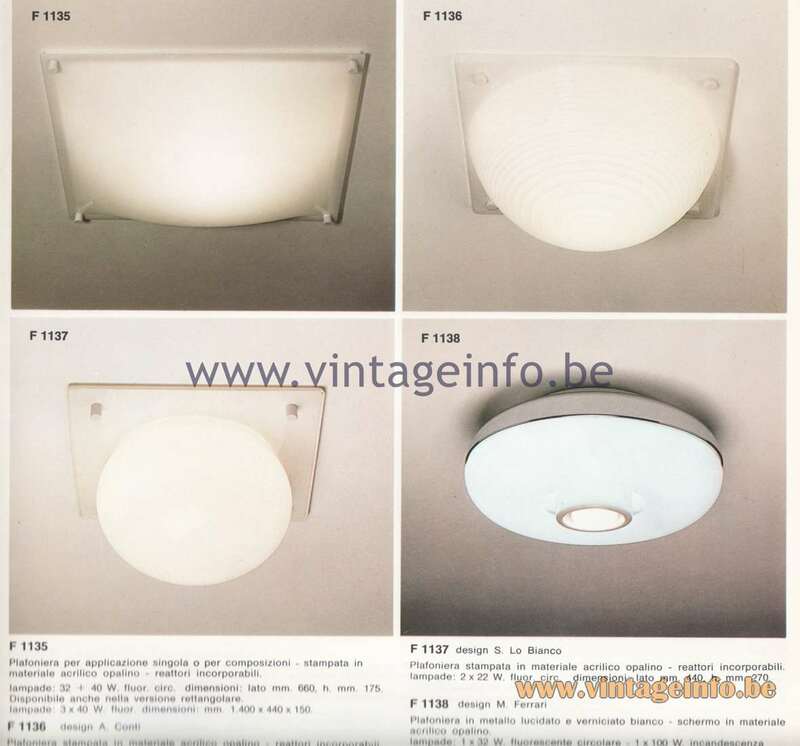 lamps: 32 x 40 W fluor. circ. dimensions: 660 mm side, h. mm. 175 Also available in the rectangular version. Lamp 3 x 40 W. fluor. dimensions: mm. 1,400 x 440 x 150. Plafoniera stampata in materiale acrilico opalino – reattori Incorporabili. lampade: 32 x 40 W fluor. circ. dimensioni: lato mm 500, h. mm. 220. Plafoniera molded in opal acrylic material – embeddable reactors. lamps: 2 x 22 W. fluor. circ. dimensions: side mm. 440, h. mm. 270. 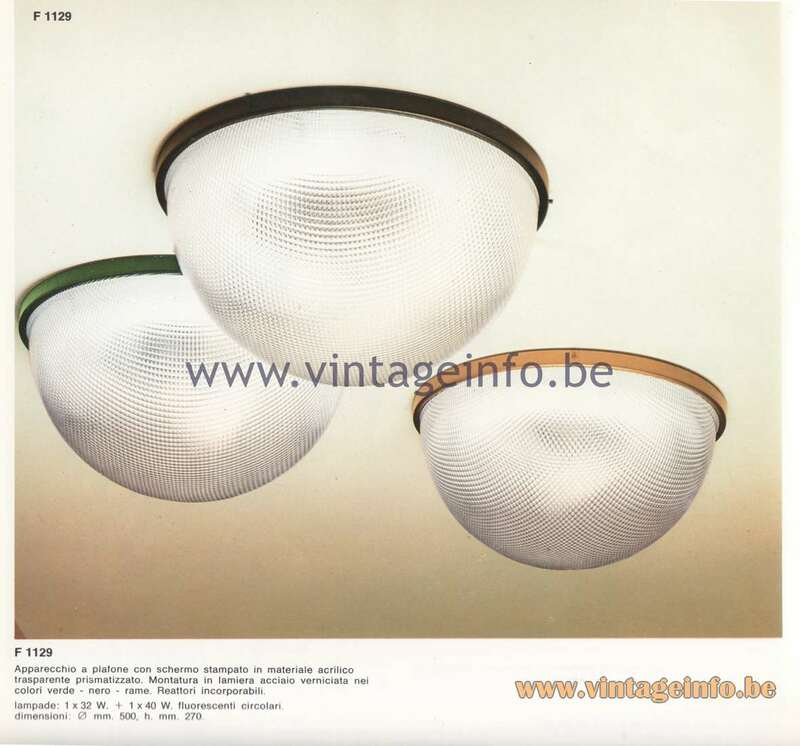 Ceiling lamp In polished and white painted metal – screen in opal acrylic. dimensions: ∅ mm 460, h. mm. 230.